(Luk 24:30–32) And it came to pass, as he sat at meat with them, he took bread, and blessed it, and broke, and gave to them. And their eyes were opened, and they knew him; and he vanished out of their sight. And they said one to another, Did not our heart burn within us, while he talked with us by the way, and while he opened to us the scriptures? (Luk 24:36–43) And as they thus spoke, Jesus himself stood in the middle of them, and said to them, Peace be to you. But they were terrified and affrighted, and supposed that they had seen a spirit. And he said to them, Why are you troubled? and why do thoughts arise in your hearts? Behold my hands and my feet, that it is I myself: handle me, and see; for a spirit has not flesh and bones, as you see me have. And when he had thus spoken, he showed them his hands and his feet. And while they yet believed not for joy, and wondered, he said to them, Have you here any meat? And they gave him a piece of a broiled fish, and of an honeycomb. And he took it, and did eat before them. Next we’ll take a look at the passages of scripture above. The first passage is a recounting of the Lord Jesus eating bread and explaining the scriptures after His resurrection, and the second passage is a recounting of the Lord Jesus eating broiled fish. What kind of help do these two passages provide for knowing God’s disposition? Can you imagine the kind of picture you get from these descriptions of the Lord Jesus eating bread and then broiled fish? Can you imagine, if the Lord Jesus were standing in front of you eating bread, how you might feel? Or if He were eating with you at the same table, eating fish and bread with people, what kind of feeling you would have at the time? If you feel you would be very close to the Lord, that He is very intimate with you, then this feeling is right. This is exactly the fruit that the Lord Jesus wanted to bear from eating bread and fish in front of the multitude after His resurrection. If the Lord Jesus had only spoken with people after His resurrection, if they could not feel His flesh and bones, but felt He was an unreachable Spirit, how would they feel? Wouldn’t they be disappointed? When people were disappointed, wouldn’t they feel abandoned? Wouldn’t they feel a distance with the Lord Jesus Christ? What kind of negative impact would this distance create on people’s relationship with God? People would certainly feel afraid, that they didn’t dare come close to Him, and then they would have an attitude of keeping Him at a respectful distance. From then on, they would sever their intimate relationship with the Lord Jesus Christ, and return to a relationship between mankind and God up in heaven, as it was before the Age of Grace. The spiritual body that people could not touch or feel would lead to the eradication of their intimacy with God, and it would also make that intimate relationship—established during the Lord Jesus Christ’s time in the flesh, with no distance between Him and humans—cease to exist. People’s feelings toward the spiritual body are only fear, avoidance, and a wordless gaze. They do not dare to get close or to have a dialogue with Him, let alone follow, trust, or have hope in Him. God was reluctant to see this type of feeling that humans had for Him. He did not want to see people avoiding Him or removing themselves from Him; He only wanted people to understand Him, come close to Him, and be His family. If your own family, your children saw you but did not recognize you, and did not dare to come close to you but always avoided you, if you could not gain their understanding for everything you had done for them, how would that make you feel? Wouldn’t it be painful? Wouldn’t you be heartbroken? That is precisely what God feels when people avoid Him. So, after His resurrection, the Lord Jesus still appeared to people in His form of flesh and blood, and ate and drank with them. God sees people as family and He also wants mankind to see Him that way; only in this way can God truly obtain people, and can people truly love and worship God. Now can you understand My intention in extracting these two passages of scripture where the Lord Jesus eats bread and explains the scriptures, and the disciples give Him broiled fish to eat after His resurrection? It can be said that the series of things that the Lord Jesus said and did after His resurrection were thoughtful, and done with kind intentions. They were full of the kindness and affection that God holds toward humanity, and full of the appreciation and meticulous care He had for the intimate relationship He had established with mankind during His time in the flesh. Even more, they were full of the nostalgia and the hope He had for the life of eating and living with His followers during His time in the flesh. So, God did not want people to feel a distance between God and man, nor did He want mankind to distance themselves from God. Even more, He didn’t want mankind to feel that the Lord Jesus after His resurrection was no longer the Lord who was so intimate with people, that He was no longer together with mankind because He returned to the spiritual world, returned to the Father who people could never see or reach. He didn’t want people to feel that there was any difference in position between Him and mankind. When God sees people who want to follow Him but keep Him at a respectful distance, His heart is in pain because that means their hearts are very far from Him, it means that it will be very difficult for Him to gain their hearts. So if He had appeared to people in a spiritual body that they could not see or touch, this would have once again distanced man from God, and it would have led mankind to mistakenly see Christ after His resurrection as having become lofty, of a different kind than humans, and someone who could no longer share a table and eat with man because humans are sinful, filthy, and can never get close to God. In order to remove these misunderstandings of mankind, the Lord Jesus did a number of things He frequently did in the flesh, as recorded in the Bible, “he took bread, and blessed it, and broke, and gave to them.” He also explained the scriptures to them, as He had used to do. All of this that the Lord Jesus did made every person who saw Him feel that the Lord had not changed, that He was still the same Lord Jesus. Even though He had been nailed to the cross and had experienced death, He had been resurrected, and had not left mankind. He had returned to be among humans, and His everything had not changed. The Son of man standing in front of people was still the same Lord Jesus. His demeanor and His conversation with people felt so familiar. He was still so full of lovingkindness, grace, and tolerance—He was still that Lord Jesus who loved others as He loved Himself, who could forgive mankind seventy times seven. 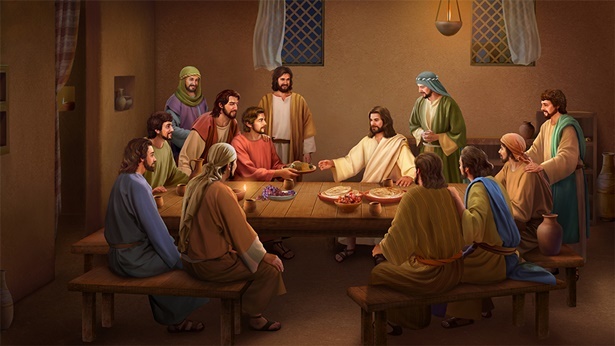 As always, He ate with people, discussed the scriptures with them, and even more importantly, just the same as before, He was made of flesh and blood and could be touched and seen. The Son of man in this way allowed people to feel that intimacy, to feel at ease, and to feel the joy of regaining something that has been lost, and they also felt at ease enough to bravely and confidently begin to rely on and look up to this Son of man who could forgive mankind of their sins. They also began to pray to the name of the Lord Jesus without hesitations, to pray to obtain His grace, His blessing, and to obtain peace and joy from Him, to gain care and protection from Him, and began to perform healings and cast out demons in the name of the Lord Jesus.